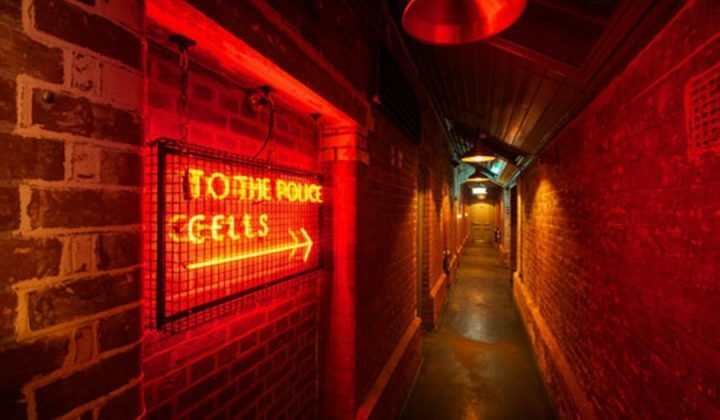 A pub and fine dining restaurant with 15 rooms, The White Horse unsurprisingly won the Best Destination Pub category in this year’s Muddy Stilettos Awards but – even with this insider knowledge tucked away in my hot pink stiletto – I was still unprepared for the lunch I was about to encounter. First up, the décor which is beach chic with a hint of industrial edge – a tough combo to pull off but one that’s executed perfectly. 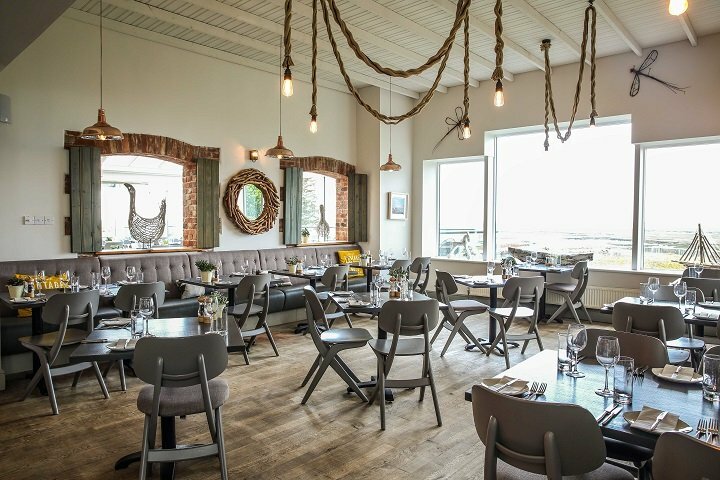 Bare light bulbs attached to sailing ropes hang low from high white ceilings in the dining area (which leads into an alfresco terrace with sweeping views of Scolt Head Island and the Norfolk Coastal Path), while bright paintings of all things fishy adorn the walls. 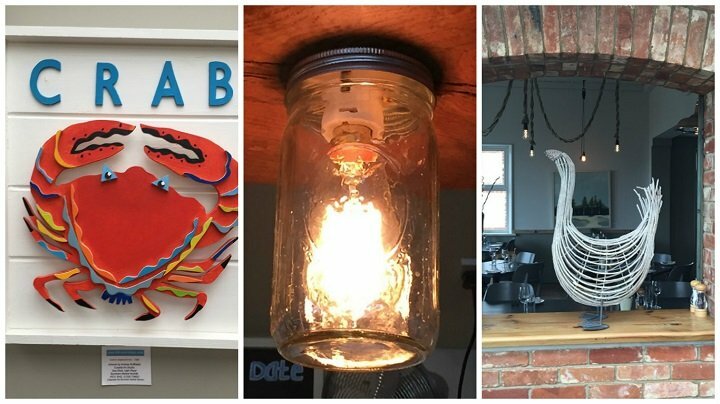 Even the lights above the bar are made from jars proving that, despite being in a position to be as snobby as hell, this establishment doesn’t take itself too seriously, displaying a certain creative quirkiness (with children of all ages more than welcome). 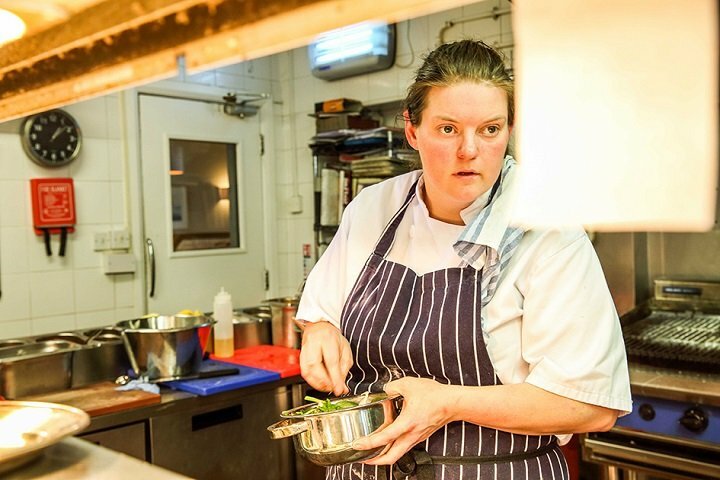 What it does take very seriously though is its food – a two AA rosette restaurant celebrating the best in seasonal, local produce. 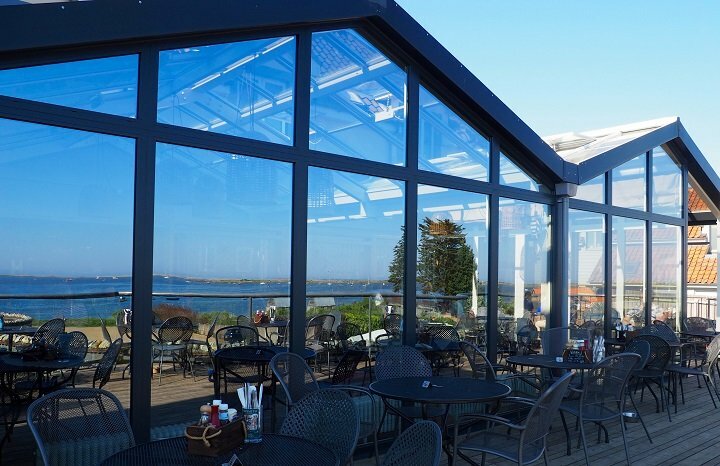 Depending on the time of year, Head Chef Fran Hartshorne selects mussels, crab, lobster, oysters, shrimp, sea bass, mackerel and sea trout directly from the fishermen working on the water below – I can see their boats all too clearly as my nose practically touches the glass in what I can only assume is the best seat in the house – while produce including asparagus is grown in beds across the road; samphire gathered from the salt marsh. 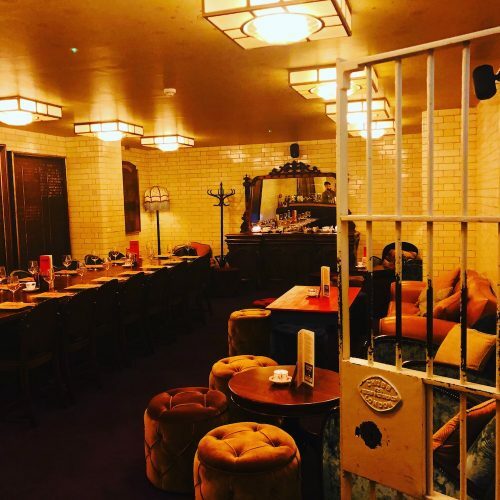 We are sampling the three-course lunch menu today but diners looking for something less formal can opt for the all-day bar menu, which includes Tapas Boards, salads and plates to share. I breathe a tiny sigh of relief when my lunch partner Henry orders the Brancaster Oysters to start, a restaurant speciality that I couldn’t stomach even if my life depended on it, despite loving the idea of them (I’m the same with olives). 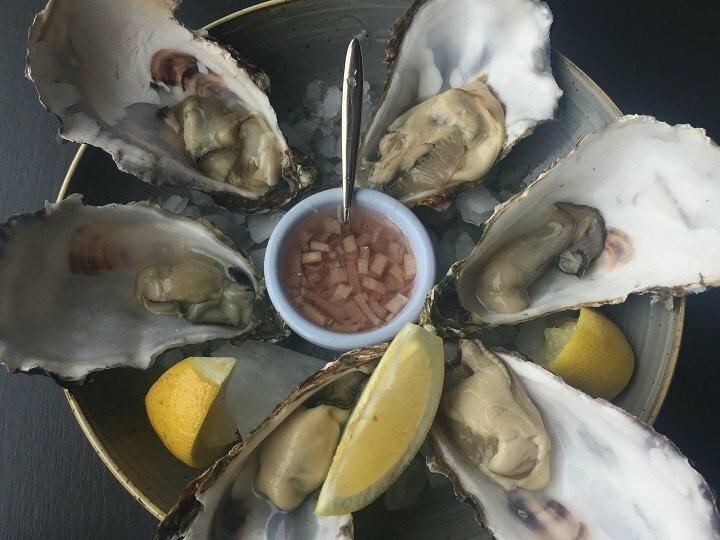 “They’re from just over there,” says our lovely waitress giving new meaning to the word local as she places six au natural oysters on the table (the bathroom can’t be much further away!). Now I’m no oyster expert, but even I know that these are big buggers – just look at the one at the top! Wow-zers. 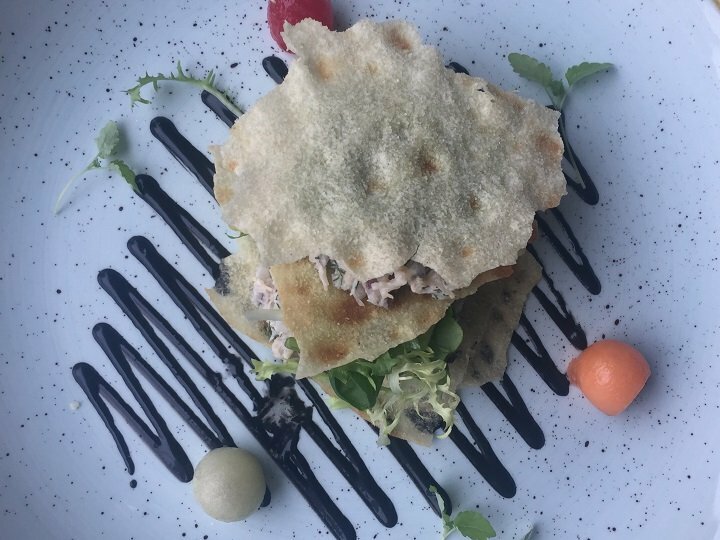 My Cromer crab dish is worthy of the photograph too, served with pickled melon, lemon balm, squid ink and music bread (which, I’m told, is wafer thin Italian white bread so delicate it resembles a sheet of music). The crab with lemon is light and fresh – the perfect accompaniment to my chilled glass of New Zealand Sauvignon Blanc – while the music bread adds a crunchy texture (it’s more like a crisp than bread); the squid ink a rich saltiness. 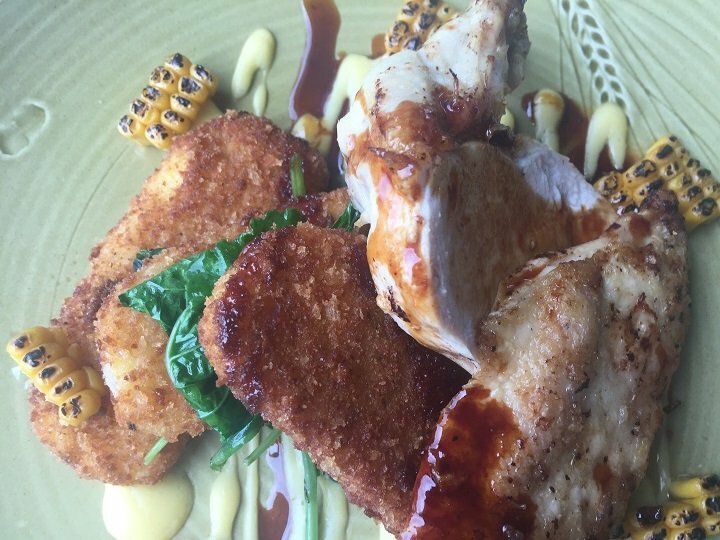 Onto mains and time to go slightly off piste (or off boat should I say), with a chicken dish of Roast free range breast served with polenta, corn, lemon thyme and summer kale (is this different to winter kale, I wonder?). The chicken is lovely and moist and the polenta comforting and wholesome without being too heavy. 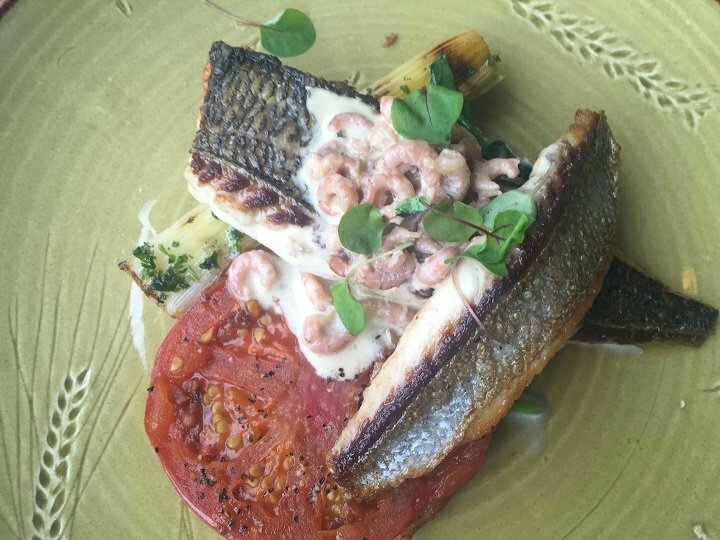 On the other side of the table, a perfectly cooked Bream filet served with tomato, King’s Lynn brown shrimp, leek and sorrel cream arrives and is polished off to satisfaction. 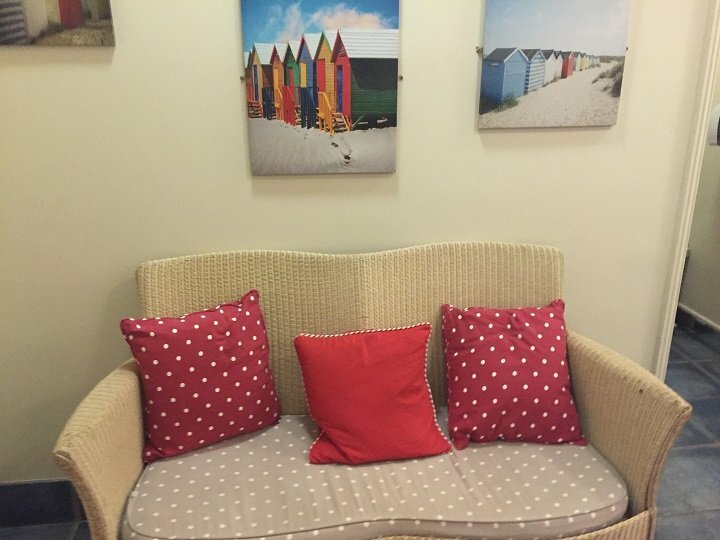 Take the weight off in the loos! 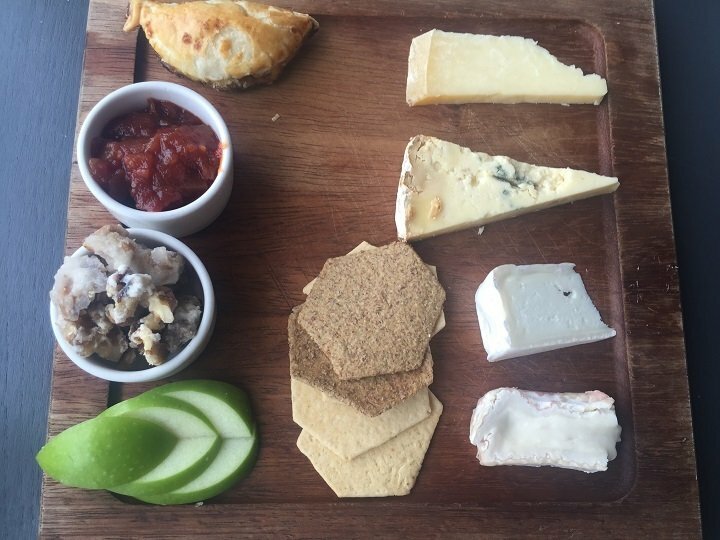 I get food envy as soon as Henry’s cheese board arrives (I’m always torn between cheese and sweet) and immediately question the little pasty-shaped item on the board which, the waiter tells me, is a small Eccles cake to add a sticky sweetness – genius. The dish consists of four English cheeses (Dorset Blue Vinny, Norfolk Smoked Dapple, Wensum White and Norfolk White Lady), candied walnuts (which are delish), homemade biscuits, slices of apple and a tomato-based chutney. Definite food envy! The green hue around me subsides when my Summer trifle arrives though – thankfully it’s much prettier than the one my mum makes at Christmas and more like a piece of perfectly-layered cake. 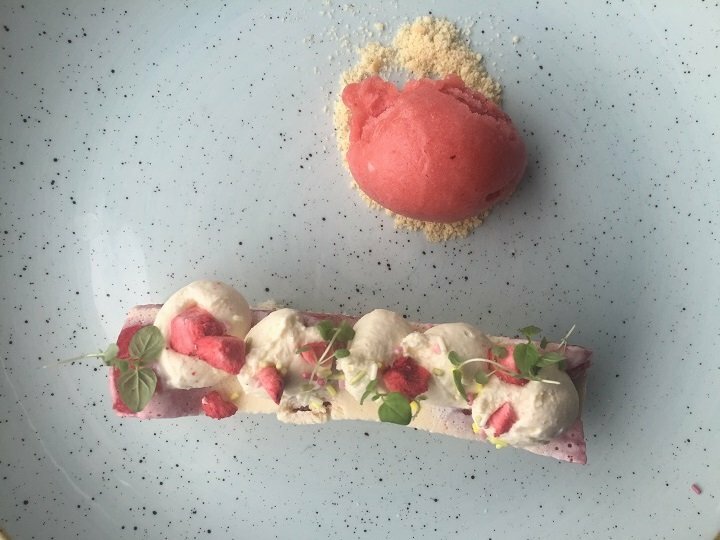 The menu informs me that the gorgeous thing I’m stuffing into my face at a rate of knots is Sharrington strawberries, Champagne and elderflower jelly, vanilla anglaise and strawberry sorbet. There isn’t a scrap left on the plate when I’m done – can you blame me? Coffee time: liquor coffee for me (without the liquor as I’m driving – boo hiss) and a green tea for Henry. 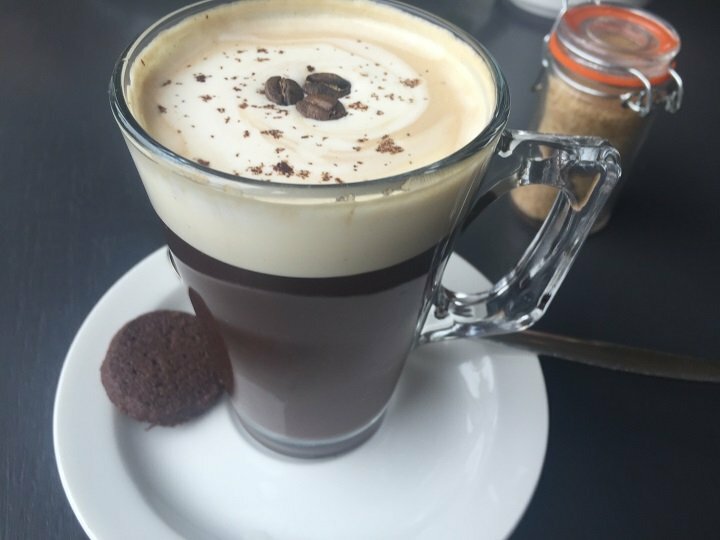 I love the three little coffee beans floating on the top of mine, but the star is definitely that tiny, unassuming biscuit on the side which is melt-in-your-mouth choccywoccydoodah heaven. I could quite easily sit here all day admiring the view and sinking another cold wine, but sadly there is work to be done back in Norwich (oh and a child to pick up from pre-school). Still, now that The White Horse and I have been properly acquainted, I will visit her again and again – let’s face it: something with this much beauty, style and taste has got to be female! 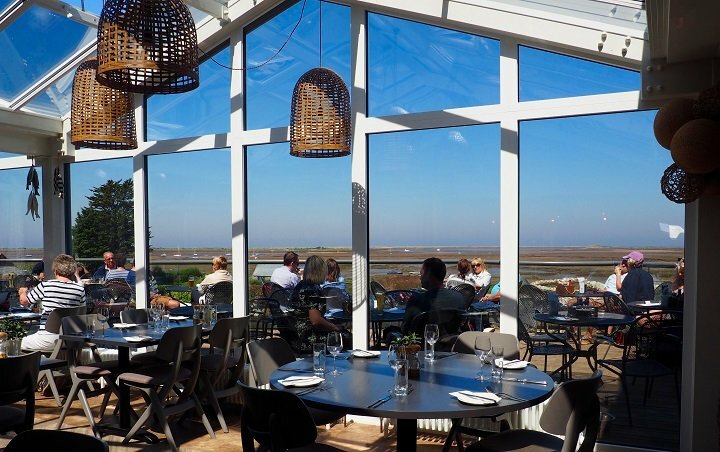 Good for: Families and couples celebrating an occasion or simply after award-winning food in relaxing surrounds with absolutely killer views; tourists wishing to experience some of Norfolk’s best views while sampling its cuisine. Not for: I honestly can’t think of anyone that The White Horse wouldn’t suit – or wow. ££: On the upper side of mid range, with starters: from £5.95; mains: from £13.50; desserts: from £5.95. This place looks amazing – can you recommend good places to stay nearby? 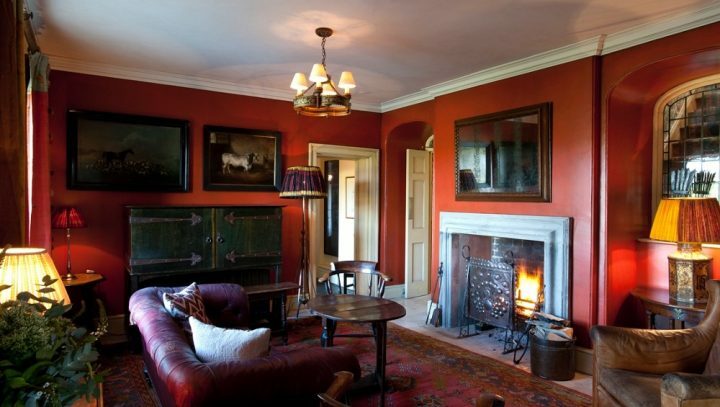 It really is Ruth – you can stay in the pub itself as it also has 15 rooms.